Professors blogg: Investigative reporter Michael Hastings' death: If neither accident nor suicide - then what? Investigative reporter Michael Hastings' death: If neither accident nor suicide - then what? Well, I hypothesized for my own that it might have been a case of suicide. That kind of suicide where the victim wishes the happening to be instead appears as accident. But today I read this email, send by Michael Hastings to some close associates some hours before his sudden demise. Michael Hastings’ text, “hope to see you all soon” would exclude a suicidal intent. I may say. And, who would like to silence to death Hastings’ announced “Big story”? 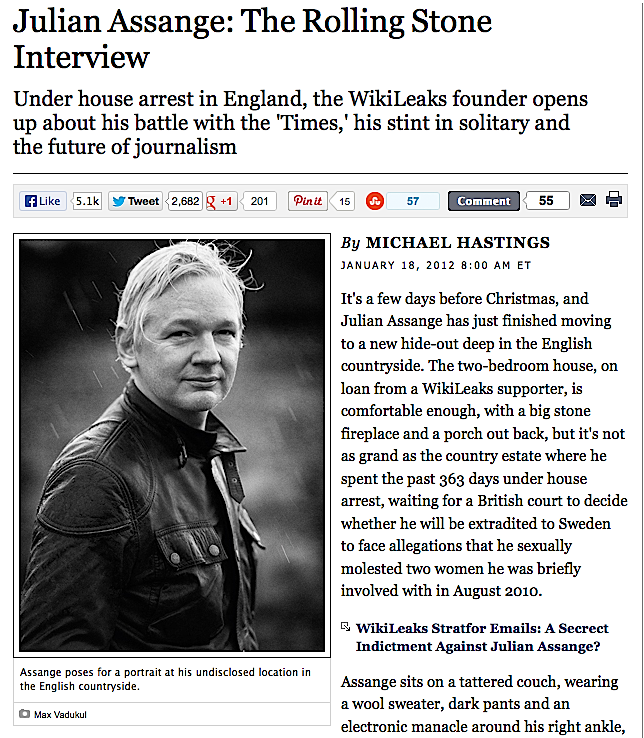 A couple of days ago I glanced at the discussion concerning the death of Michael Hastings, the journalist from Rolling Stones who authored a notable interview/reportage on the WikiLeaks founder Julian Assange. "Extradition is a political matter. The extradition treaties – those from the U.K. to the U.S. and from Sweden to the U.S. – are both very dangerous for me. Every day that I remain in England, it is dangerous, and if I am in Sweden, it will be at least as dangerous as it is here, and very probably more so. The Swedish foreign minister responsible for extradition, Carl Bildt, became a U.S. Embassy informant in 1973 when he was 24 years old. He shipped his personal effects to Washington, to lead a conservative leadership program, where he met Karl Rove." Hastings is reported to have died in a "fierce car-crash". In spite of the speculations around his unexpected death, I admit I was quite sceptic about the assassination thesis (not because I am ready to disregard any “conspiracy theory” as purely nonsense – as certain detractors affirm per default in their comments around the case Assange, WikiLeaks, or the on the information war). Well, I hypothesized for my own that it might have been a case of suicide. That kind of suicide where the victim wishes the happening to be instead appears as accident. I have developed this concept during my research at the Karolinska Institutet in the 90’s; a phenomenon that I called “Metasuicide”, and which it was in an article I published in Acta Psychiatrica Scandinavica. It discussed a kind of violent death, where forensics cannot establish with certainty a self-destructive intent with fatal aim; neither if the injury was externally produced. We also referred it to as UMSA cases (for “Undetermined cause, suicide or accident”). As a matter of fact, Sweden was found to have the highest rate in Europe among such cases, and where these are labelled as “osäkra självmord”. A typical forensic scenario: vehicle at high speed, crushing to a pole or tree, no breaks traces in pavement, mechanical failure not otherwise established. Why suicidal individuals would conceal their suicidal intent at their demise, it is another theme; and perhaps “Psychological autopsy” it could give an answer (history of severe depression, ptsd and torture, etc). As I said, the thought crossed my mind on that Hastings case it could have been one of metasuicide. But today I read this email, send by Michael Hastings to some close associates some hours before his sudden demise. I could not however established – it is not commented in any of those dispatches - whether the email operator used by Hastings was Google’s Gmail.com. Nevertheless, Michael Hastings' text, "hope to see you all soon" would exclude a suicidal intent. I may say. And, who would like to silence to death Hastings' announced "Big story"? According to an article in the Los Angeles Times, "Michael Hastings researching Jill Kelley case before death", the deceased journalist was working on a report detailing whereabouts of a privacy lawsuit against the FBI and the State Department. The FBI denied that they would have been investigating journalist Michael Hastings before his death, but the organization WikiLeaks informed on the 19 of June that the journalist "contacted WikiLeaks lawyer Jennifer Robinson just a few hours before he died, saying that the FBI was investigating him". See below.